It is designed to add 4 x additional and individually configurable and addressable RS-232, RS-422, or RS-485 (half- or full-duplex) serial ports to an SDM-capable datalogger for the purposes of interfacing with intelligent sensors, actuators, or displays. Up to three SDM-SIO4A modules can be connected to a single datalogger SDM port. The SDM-SIO4A channels behave much like a native datalogger serial port and use the same familiar serial I/O commands. The SDM-SIO4A is transient and surge protected to IEC61000-4-5 level 4 on the serial port interfaces, avoiding the need for separate transient protection in most applications. Note: The SDM-SIO4A is not a direct replacement for the SDM-SIO4 which is no longer available. 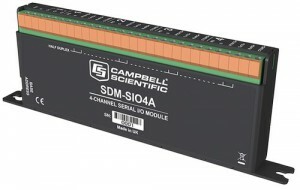 The SDM-SIO4A consists of four SDM-SIO1A modules in a single package. Consequently, the SDM-SIO4A is a good replacement for up to four SDM-SIO1 modules or as an alternative to the SDM-SIO1A. Data rates: 300, 1200, 2400, 4800, 9600, 19200, 38400, 57600, and 115200 bits/s. Autobaud NOT supported. Supported modes: RS-232 (full duplex and receive only); RS-485 (half and full duplex); RS-422 (half and full duplex); Hardware CTS/RTS flow control is supported in RS-232 mode. The handshaking lines can also be used as general purpose I/O lines. Compatible dataloggers (using SDM): CR800-series, CR1000, CR3000, CR9000X (OS>6), CR6. The CR10X and other Edlog dataloggers are NOT compatible.